The Nike 1 World project linked several Influencers in the sports and fashion cultures with the Nike Air Force 1 Brand. This particular Nike Air Force One Low Supreme Inside-Out is also part of the 1 World series and is the product of Nike x Diasuke Matsuzaka AKA “The Monster” AKA “Dice K”. 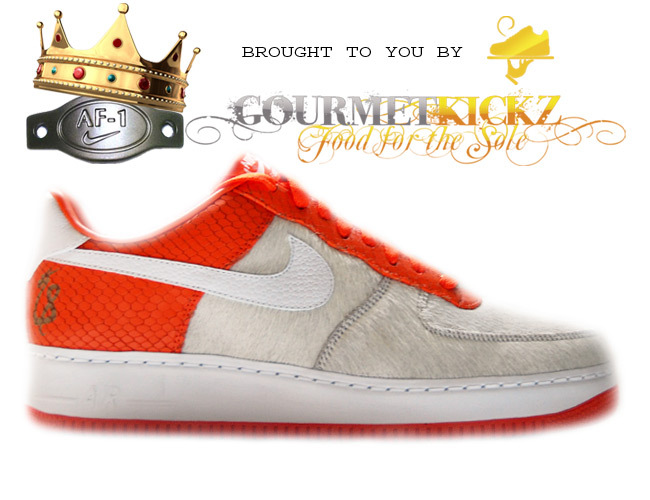 When given the chance to design an AF1 Matsuzaka hit this one out of the park! He used materials presented to him by Nike that were not normally used on an Air Force. He wanted to create something out of the ordinary with uncommon materials. To accomplish this task he selected white pony hair for the toebox, frontal, and sidewalls of the sneaker. In addition he selected a beaded patent leather for the swoosh and heel tab. And to finish off the sheer absurdity of the this wild sneaker, he decided on orange “dragon scaled” leather for the heel and eyestay. The decision to choose a dragon scale effect for the leather came from his Japanese heritage and that cultures devout involvement of the dragon in art, literature, architecture, mythology and folklore. The finishing touch is the laser etched dragon the heel panel of each sneaker. This custom Nike Air Force 1 Low DutchMaster II was created alongside the previously mentioned “Get Blunted” compilation. 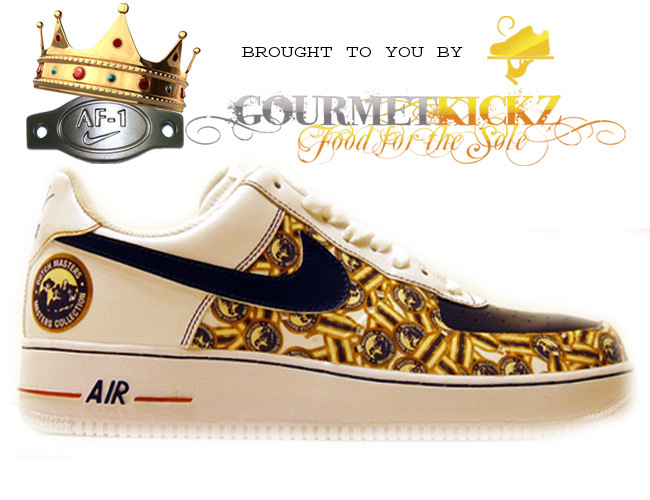 This custom sneaker was one of the most popular custom Nike Air Force Ones that were designed by GourmetKickz. 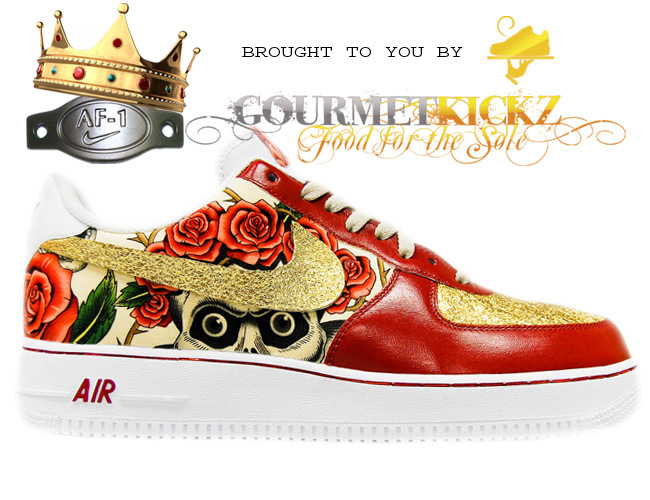 This custom Nike Air Force One Low was designed as a special series launched on GripTeez retail division of Datpiff. 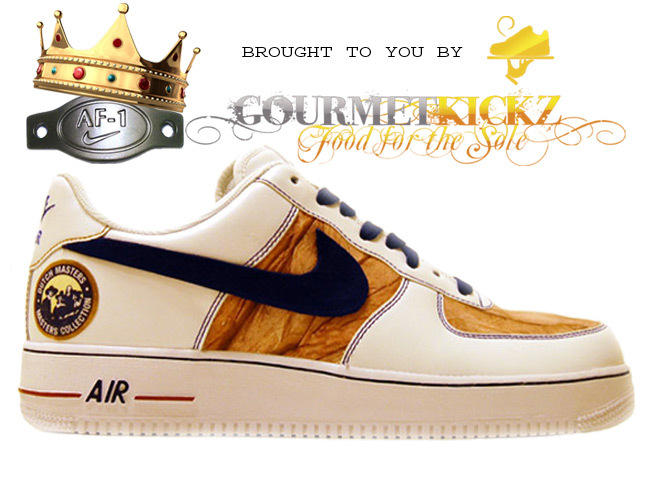 This special series of GourmetKickz quickly became one of the most amazing pairs of custom Nike AF1s that Chef created. This custom sneaker has several special details associated with its design. The skull fabric is applied seamlessly to the heel and sidewalls, locking the two panels into one canvas so as to display the entire graphic. The toebox and swoosh are affixed with golden fabric while the frontal and eyestay portions are painted with vibrant magenta-red hooking up to the fabric. The tongue tag is also affixed with fabric while the midsole stitching and AIR logo are hand painted in magenta-red. This custom Nike Air Force 1 Low DutchMaster was created over 2 years ago for a series known as the “Get Blunted” compilation. The series of custom sneakers was exclusive to GripTeez.com (an e-commerce extension of hip-hop monster DatPiff.com ) and become of the hottest selling custom kicks on the site for an entire year. 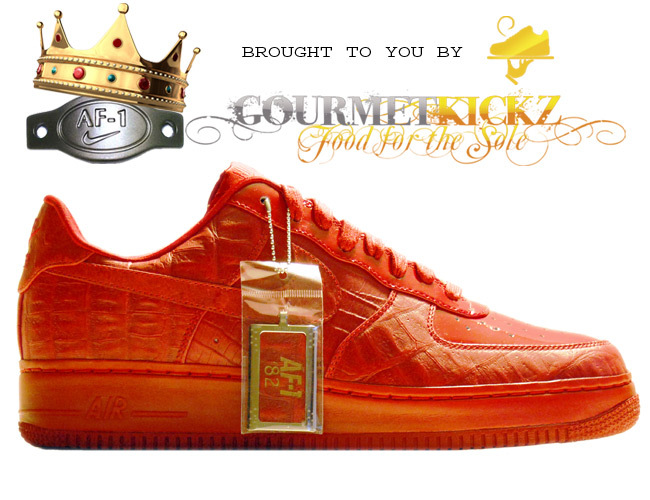 This series deserves a highlight on AF1King because of its legendary status and worldwide reach. As many of you know, the sneaker culture recently suffered a great loss. Reggie Holloway, a well known collector and member of several online sneaker forums died on March 17, 2010 from complications due to the H1N1 virus. A loss of this nature has not been felt since the untimely death of s0lerebel aka Allon Iny. Reggie died at the age of 20, but not before amassing an impressive collection of sneakers. Reggie’s love affair with the Nike Air Force 1 was evident through his collection and the ties he made to other collectors and vendors on the internet. From Japan to Europe he was known to be a true Air Force Connoisseur. He shared this passion with his father who survives the son but keeps the legacy alive. The pair recently received a token of recognition from the bosom of Nike Sportswear itself and Beacon of the AF1 brand: 21 Mercer Street aka Bespoke Headquarters. Having taken up a collection to achieve the goal of $820, funds were acquired within 24 hours with the help of Sneaker Culture Philanthropists like Dj Clark Kent, Brian aka Kadoma of the H-Town Sneaker Summit in Houston, Matt Halfhill from NiceKicks, and YM of the great SneakerNews. These channels successfully drew enough traffic and opened enough hearts and wallets to memorialize Reggie’s passing with 2 Pair of Nike Air Force 1 Bespokes: 1 to honor Reggie and one for his father to cherish. 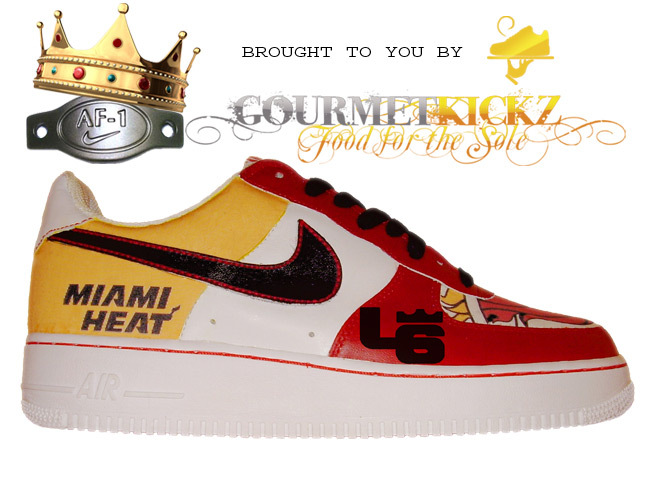 These Custom Nike Air Force 1 Miami Heat Lebron James Edition sneakers are posted just as Lebron James announces his decision to take his talents to South Beach Miami to play with the Miami Heat! Well this pair of sneakers honors his decision by mating both the iconic Miami Heat logo and flaming basketball design with the popular Lebron James logo. For all your Lebron James fans and Nike AF1 fans, this should be an instant grab! These custom sneakers designed by GourmetKickz should be worn with pride and become a benchmark in your collection to note this moment in history when King James himself left his kingdom to conquer another! *update – Since Lebron James will not be wearing #23 any longer and no known official LBJ6 logo has yet been identified, these customs have been adjusted to bear an ingenious LBJ6 logo designed by my close friends at SneakerNews. These custom Nike Air Force One Low sneakers were designed by GourmetKickz specifically for a client who requested that his favorite snack be represented on a pair of custom kicks. These fresh sneakers consist of custom artwork printed on high quality cotton mated to an all white AF1 Low in a seamless fashion covering the toebox, frontal, and quarter panels (vamps) of the sneaker. Each swoosh is painted a different color; representing each color in the Skittles rainbow of fruit flavors. Additionally the red areas you see on the heel and eyestay are actually “candy coated” red, having been treated with gold flake which really make these custom kicks pop in the sunlight. You can see more detailed images of these insane custom sneakers here or simply purchase below. If you would like to see what exactly has been done to these sneakers in list form, check out the GourmetKickz Creator summary here. The Nike Air Force One Supreme Inside-Out “Mad Hectic” is an extremely limited pair of AF1’s that were released only in Japan at the 1Love location. These sneakers were created at Nike’s FT factory: Feng Tay Group which is a high end factory specializing in product development and luxury materials. As you will notice, this sneaker is part of the 318500 grouping of style numbers: this series includes other sneakers such as the un-released crocodile and nubuck series of AF1‘s that were found at Packer’s and later at 21 Mercer. These sneakers feature a fully embossed leather upper featuring crocodile print. The toebox and eyestay are finished with thick patent leather. The insole is premium leather and the sockliner is done in typical co.jp nylon. The midsole is full red leather and the lacelock is also done in crocodile embossed, laser etched leather mated to a metal base. This pair of 3D Custom Nike Air Force Ones uses one of my personal favorite pieces of artwork from the GourmetKickz Creator: Hannah Stouffer’s jungle scene art. It uses this artwork in just the toebox of the Nike AF1 Low, but accents the art with great color blocking throughout the rest of the sneaker. This custom sneaker would be a sure way to get attention from both lovers of art and sneakerheads. They reside now only in 3D within the custom sneaker generator called the GourmetKickz Creator but upon ordering will be hand made by Chef of GourmetKickz. Remember, when you use the Design Your Own Custom Kickz application from Chef, you are basicially designing in 3D with his skills. 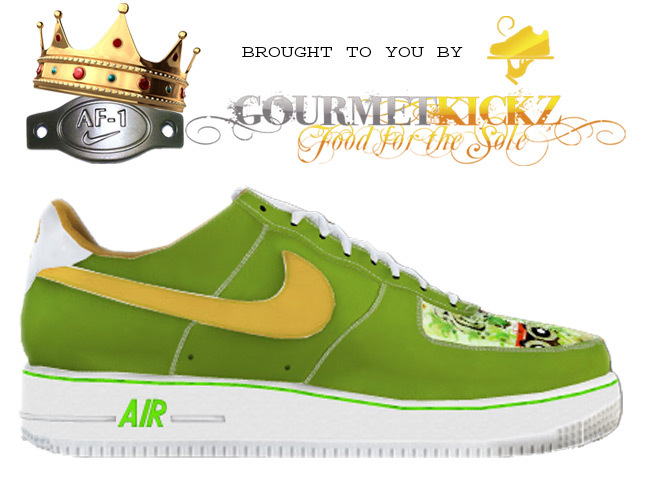 This manner of design uses a set of rules called “ChefLogic“, they define what Chef will and will not do to a Nike Air Force 1 sneaker. If you seek other customizations on this particular design you can build on top of this pair of custom Nike sneakers or take the time to review exactly what has been done to them. 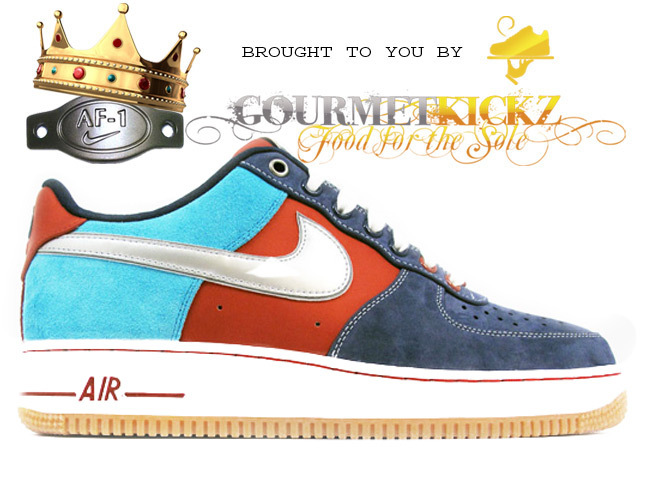 You can view these custom Nike Air Force One Lows in 3D or browse other 3D designs from this site or the user gallery in the kicks creator. For the past several years Nike has released an exclusive Nike Air Force 1 Low on select Military Bases and Exchange stores in honor of Fleet Week. This AF1 Low is among those limited releases. It is the 2nd installment in the ongoing series having released in 2006. This sneaker features premium leather with a leather insole and woven red, white, and blue nylon in the toebox. 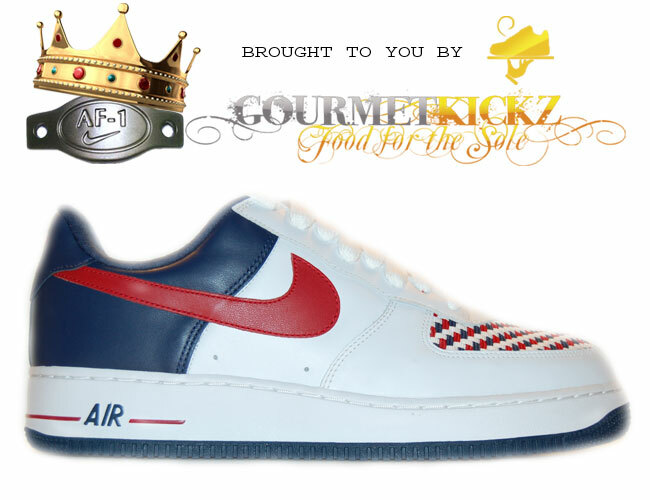 Only one size remains from Chef of GourmetKickz collection of rare Nike Air Force Ones. Though this Nike Air Force 1 Low was produced in moderate numbers, limited access to Military Bases made it nearly impossible for civilians to get. So here is your chance to cop this pair of rare Nike AF1’s.